Maybe you started one ten years ago, or you've meant to do it for the last decade. Possibly, a bucket list has never even crossed your mind as something worth creating. Everyone's list is a little different, from climbing Mt. Everest to eating a pickle for the first time, but there are good reasons why so many people make a bucket list and why yours is worth making today. Is getting married a must? Do you want to spend your whole life in the same city? When do you want to retire? Whether you're young or in the second half of your life, it may surprise you to discover you're not clear on your goals and priorities in life. 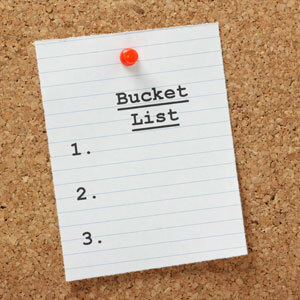 Making a bucket list encourages and challenges you to sit down and decide what matters most. Understanding and listing your true priorities helps guide you to a fuller and happier life. Recognizing your priorities and goals can offer great prospective. It's easy to get caught up in the everyday and forget how much you enjoy traveling or that you always wanted to perfect that cookie recipe from your grandmother. Over time, you may lose touch with your true desires. Creating a bucket list is a great way to remind yourself to live your life fully and be mindful of how much time is left to carry out your dreams. After you've come up with some ideas for your bucket list, talk to an online psychic about what the future holds and what your new choices could mean. The anonymity will make you feel comfortable while you receive helpful advice for your future. It's not always easy to face the future, but it's easier when you know what you want and what it could mean to you. When you stop to think about your passions, you gain perspective on how you're spending your time now versus what you're missing out on. Making a bucket list can help you realize or get back in touch with what you value most. Important life decisions like a move or career change or marriage can become clearer. Consider a live psychic reading to ease any worries about whether you're heading in a better life direction. So you've organized your goals and values, gained perspective, and committed to living a fuller life. Bravo! Sometimes we still need a push to stay positive and focus on what's important. A bucket list is a great reminder of what you want out of life. Once you've got everything written, try putting it someplace where you'll be reminded of it often. Most importantly, have fun with your list! It's not every day you get to decide your greatest future.